Two bedroom apartments feature a large living room, 1 ½ bathrooms, an eat-in kitchen with full-size appliances and a walk-in pantry. Master bedrooms have a half-bath and generous closet space. 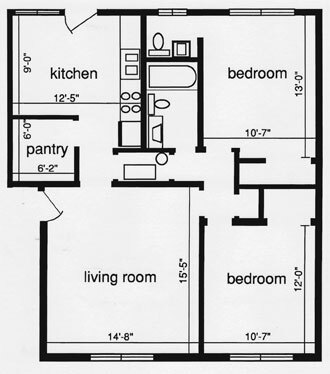 Two bedroom apartments are approximately 870 square feet. In 2012, two bedroom unit prices range from $575 - $625. Contact us about our two bedroom apartments!